Agathon Rwasa was born in the Ngozi region of Burundi in 1964. Rwasa fled his native Burundi in 1998 following the events in Ntega-Marangara region of Burundi, an ethnic conflict which resulted in the killing of several hundred people. Rwasa sought aslyum in neighboring Rwanda. At age 24, Rwasa enlisted in the military. He was a He later became a recognized political and military figure while the Papilehutu. a rebel group in Burundi, were in power. 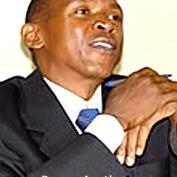 In January of 1998, Rwasa was appointed the head of military operations in Rural Bujumbura. In February 2001, Rwasa assumed leadership of the armed wing National Liberation Forces (FNL) after outsting former leader Cossen Kabura. In June 2010, Rwasa ran as presidental candidate for the Republic of Burundi but dropped out before the June 28, 2010 election day along with all the opposition group candidates. Rwasa is reported to be in hiding since June 2010.